A detailed understanding of the coastal line and the underlying seafloor shape (the bathymetry data) is essential for an accurate simulation. Image courtesy Simon Lin, ASGC. 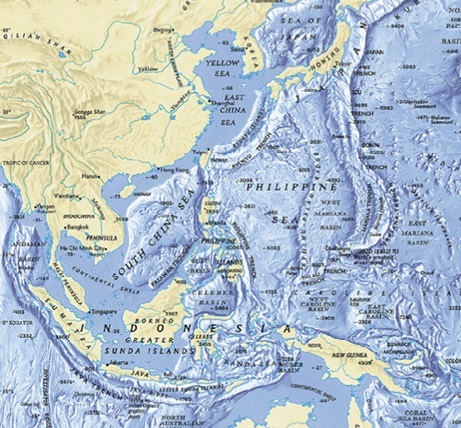 Immediately to the south-west of Taiwan, is the South China Sea and the deep oceanic Manila trench. Roughly every 10 years, the area experiences a moderate earthquake (under 6.9 on the Richter scale). However, there has not been a major earthquake since the 1570s. GPS data and global historical records show that every 700 years an earthquake of magnitude 9.0 is likely to strike the area. The region, therefore, is due one relatively soon (in terms of geological time frames) and if (or when) a mega-sized one does strike, people living in the region need to be prepared. 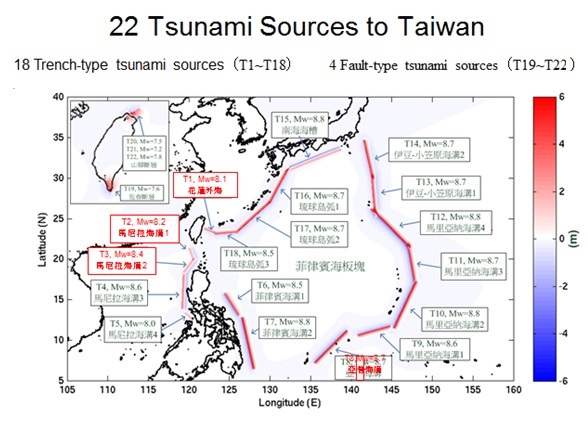 Fortunately, seismologists and computational specialists in Taiwan and neighboring countries have been working together to establish a tsunami real-time simulation system for the region. At last month’s International Symposium for Grids and Clouds (ISGC), researchers presented a web-based portal, iCOMCOT, and a recent paper showing the impact of 22 possible regional tsunami scenarios. There is, unfortunately, a scarcity of data related to the tidal impact of mega earthquake events in the South China Sea region. The area is also not covered by the global early tsunami warning system ? US NOAA network of 39 DART II (Deep-ocean Assessment and Reporting of Tsunamis) buoys. 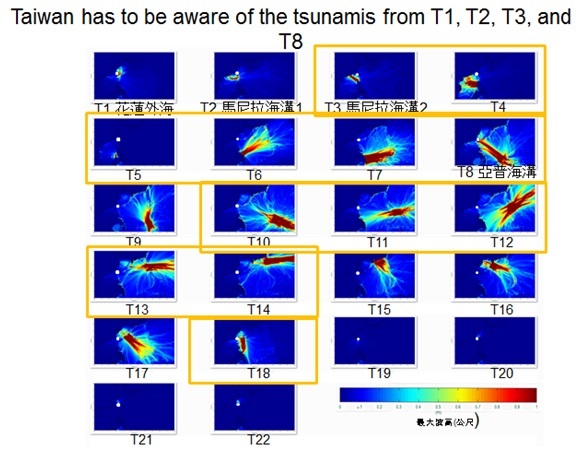 So, with no early warning system in place, Simon Lin of Academica Sinica Grid Computing Center (ASGC), Taiwan, and Tso-Ren Wu, an assistant professor at the National Central University in Chung-Li City, Taiwan, set out to predict the behavior and effects of the most likely tsunami scenarios. The spatial distribution of 18 trench-typed tsunami sources (T1-T-18) and 4 fault-typed tsunami sources (T19-T-22). The color bar indicates the seafloor displacement of each tsunami source.Click for large version. Image courtesy Simon Lin, ASGC, from Tso-Ren Wu’s paper. COMCOT (Cornell Multi-grid Coupled Tsunami Model) is a numerical model that allows both simulation and visualization of the whole lifespan of a tsunami. It shows how a wave will travel on the earth and gives an estimate of its arrival time and the level of run up on to dry land. “The original research model focuses on accuracy and not speed; it took between 12 to 24 hours to generate a result. But for the system to be operational, COMCOT needed to simulate a tsunami as fast as real time propagation, from hours to minutes,” says Wu. Usually an operational system sacrifices some level of accuracy, but COMCOT allows both linear and non-linear equations. “A linear system speeds up the operation and is accurate for the deep ocean, but is not precise enough for the near-shore region. When the wave approaches the shoreline its speed diminishes, and it becomes thinner and taller so the curve can no longer be represented linearly. Most tsunami systems ignore this part of the simulation but it is the most important to impact on human life,” explains Wu. COMCOT integrates the spherical with a Cartesian coordinate system, which is more accurate for near shore simulations. Wu enlisted help from grid experts and resources at ASGC to optimize and speed up the code. The ASGC research team used OpenMPAPI (Open MultiProcessing) to parallelize COMCOT for shared memory multiprocessing. This made the system 10 times faster, with a simulation taking just 3 to 5 minutes. The research group’s second objective was to make the user interface simple-to-use. With previous versions, users needed to understand Matlab or Octave to generate a visualized result, explains Hsu. It has now been reconfigured as a web-based portal, iCOMCOT, which can be run on a desktop or portable device. “iCOMCOT allows the user to visualize the relationship between the three main parameters – the focal mechanism, nested grids and tide stations, and lets them see the result directly on their iPhone,” explained John Hsu, an engineer at ASGC, who presented iCOMCOT on behalf of Simon Lin’s research group. The maximum tsunami wave height in the simulations of 22 tsunami scenarios (results of the first-layer nested grid). Color-bar indicates the maximum wave height in meters. Click for large version. Image courtesy Simon Lin, ASGC from Tso-Ren Wu’s paper. Finally, the results had to be confirmed by observed data. The code was validated using the vast volumes of data collected in the aftermath of the T�貧oku Japan earthquake. Before it can be made publicly available, a beta-version of the portal will first be tested by 20 research groups from Asia, Europe and America. Future plans include coupling the model with an early earthquake warning system working alongside seismologists in the neighboring Francophone Institute for Computer Science in Vietnam and the Philippine Institute of Volcanology and Seismology (Phivolcs). As earthquake reports are circulated several hours or even days after an event, it is important to deploy sensors to detect activity and determine the underlying focal mechanism as close to real-time as possible, emphasizes Lin. The plan is to deploy hundreds of inexpensive sensors to make approximation faster, using primary-wave earthquake early prediction systems and low-cost quake-catcher networks across schools in the region. This approach should reduce costs for countries that cannot afford the installation and management of high-priced seismic sensor stations. ASGC are confident that developing grid nodes in different countries will improve the system as they build up a database of pre-calculated earthquake/tsunami scenarios. The system could also eventually be applied to GIS-based service weather modeling. Simon Lin describes this collaboration as ‘e-science for the masses’. “One country alone cannot mitigate the effects of any potential disasters by themselves. This effort can bring different countries in Asia together, as when a tsunami happens it will cross national borders. The portal creates a space that makes coordination and sharing flexible resources possible for different groups of researchers. Users can add in/integrate resources enabling future collaboration”. Beneath the mountainous island of Taiwan, recent GPS data indicates that ground movements are very active, similar to the activity of the T�貧oku earthquake (around 8cm per year), so it is possible that there will be a large earthquake in the area west of Luzon island, cautions Wu. Based on one of his seismic simulation scenarios, the resulting wave would arrive in Taiwan in 20 minutes. Copyright © 2007 Tsunami Science Research Laboratory All Rights Reserved.